Trek Bicycle is making the commemorative bike Fabian Cancellara has ridden during this year’s Tour de France available to riders throughout the world on the day the race rolled into the legend’s hometown of Berne, Switzerland. Featuring a unique graphic scheme that celebrates the various teams and milestones of the legendary athlete’s career, the bike was first unveiled just days before the race’s 2016 edition. While best known for his early season exploits, Cancellara has a lengthy resume of success in the world’s most famous race, including seven stage victories and an astounding 29 days wearing the yellow jersey. The bike is now available for riders to build to their exact preference through Trek’s custom bike program, Project One. With 2016 set to be the final chapter in Cancellara’s legendary story, Trek’s graphic design team set about creating a series of bikes that would celebrate not only the races that defined the Swiss rider’s illustrious career, but also the teams and people that were a part of it. The first of these bikes was ridden in March’s Milan-San Remo. While the bikes garnered attention throughout the season, none thus far has caused the overwhelming reaction from fans and media as the Fabian Tour Edition. 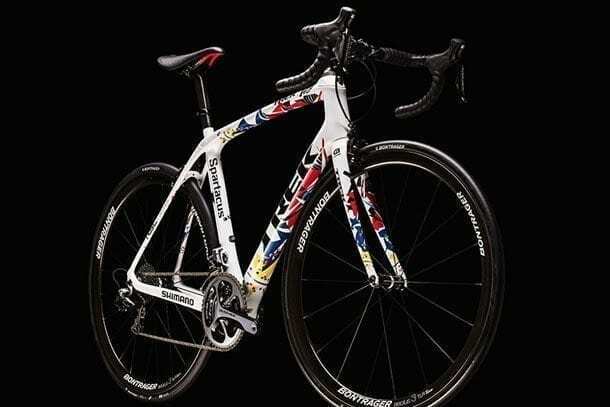 Conceptualized by Trek graphic designer Brian Lindstrom, and hand-painted in Waterloo, WI, the bike is a graphical representation of the palmares and various jerseys the rider known throughout the world as “Spartacus” has adorned over a professional career spanning 16 years. Paying homage to the moniker that is so synonymous with the rider, Lindstrom opted for the downtube of Cancellara’s Trek Madone to prominently display the name through his last go at Le Tour. The Fabian Tour Edition is available immediately in Trek’s Domane and Madone platforms through Project One.